Welcome to level 8, now you can learn real magic! 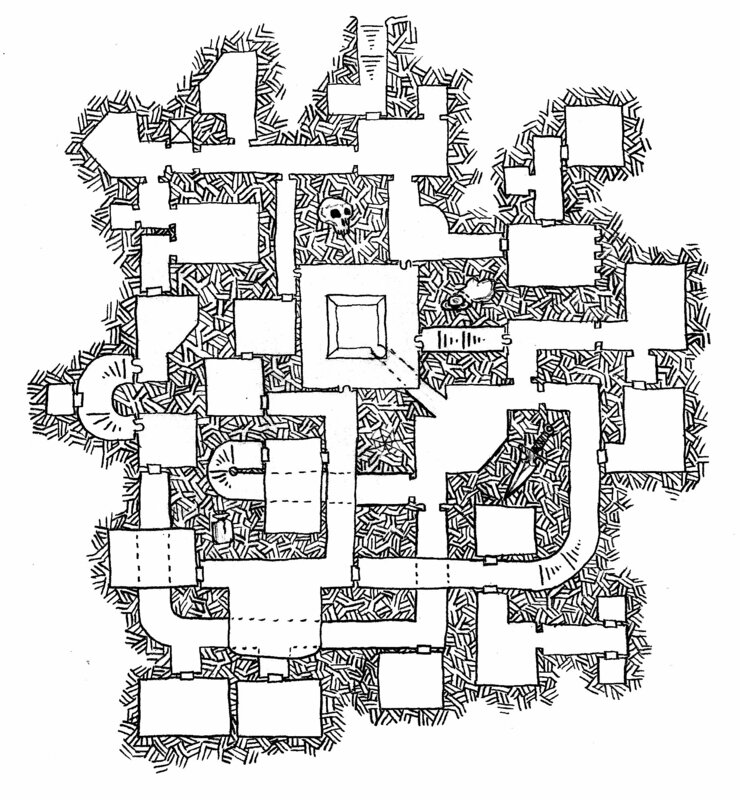 It has come to my attention courtesy of Dave Thompson that there is at least one map in Dyson’s Delves that never made it up to the blog. It took me an hour of searching through a variety of hard drives to find it too. Part of the problem, I think, is that I never came up with a good name for it… so it got named “Level 8” (being the mythical level at which you get to learn REAL magic). This map goes back to the time when I was drawing maps in pencil on plain paper with a gridded page behind the page I was drawing on. I also added a few little ornaments to the cross-hatching in this one – dagger, vial, sack of coins and the very visible skull front and centre. Ok, there is one more map that appears in the Deluxe edition of Dyson’s Delves that won’t be making an appearance on the blog, but that was part of the whole promotion to buy the first 100 copies of said book. On the Patreon Campaign front, I made a technical mistake while releasing the last two maps that I marked on the system as “Content” but failed to notice the drop-down elsewhere on the publication page that was set to “Free” so I could switch it to “Paid”. So now with that hiccup out of the way, the Patreon Campaign is operational and many thanks to my patrons. Specific thanks to individual patrons who are making a difference will be coming soon. This map, being over three years old, has not been set as “content” according to the Patreon campaign. As promised in the campaign, any maps posted beyond the usual 2 per week would be posted as “freebies”.